Provide comfort for the family of Jessica Loch with a meaningful gesture of sympathy. Jessica Jayne (O’Rourke) Loch (67) passed away peacefully on January 17, 2019, at her home in Kansas City, Missouri, surrounded by her loving family. Jessica was born on February 8, 1951, in Mason City, Iowa, to Clement and Laurel O’Rourke. Jessica lived life the only way she knew how: in service to others. From the time she was born as the oldest child of seven, she took on the role of mother hen. When she met her husband Bill at Northwest Missouri State University in 1970 during a hayrack ride, he quickly convinced her that he was the only man for her. It did not take her long to fall in love with Bill, or his 1967 GTO. The courtship was short, and they married on May 27, 1972, in Rockford, Iowa. Jessica and Bill built their life together in Maryville, Missouri, where she immediately began her philanthropic and volunteer efforts. She was passionate about people and their causes and never said no to someone in need of help. She was actively involved with the Maryville Chapter L of PEO (twice Chapter President), St. Francis Hospital Auxiliary, Daughters of the American Revolution, Children’s Mercy Hospital, and CASA. She was honored to be a part of numerous philanthropic ventures such as the Rickard Trust, where she helped secure funds for emergency responders. Jessica also served the community raising money for causes such as the Maryville Public Library and the Nodaway County Historical Society. For decades, she loved being an advisor to her beloved sisterhood of the Sigma Sigma Sigma Sorority and was known to many of her friends as the Town Crier, an endeavor she utilized to engage others in the community helping those in need. She also enjoyed spending time with her friends playing bridge and Mah Jongg. Her faith in the Catholic Church was taught to her by her mother and father and passed along to her children. She loved her involvement at St. Gregory’s and was a lector at mass. Jessica is survived by her loving husband James William (Bill) Loch of nearly 47 years; her three children, Courtney (Loch) Albertson and husband Kevin; Jaimie Loch and wife Abby; Brittney (Loch) Matousek and husband Mike; her five grandchildren, Liam Loch (7), Drake Loch (5), Loch Matousek (4), Lucas Loch (1), and Keegan Albertson (15). She is also survived by her mother Laurel (Hanson) O’Rourke of Kansas City, Missouri; her five siblings, Tracy Wiley of Raytown, Missouri; Patrick O’Rourke and wife Jane of Fort Dodge, Iowa; Scott O’Rourke and wife Yulanda of Mustang, Oklahoma; Kelley O’Rourke of Mason City, Iowa; Erin (O’Rourke) Fingalsen and husband Shane of Manhattan, Kansas; and her brother-in-law Robert Loch Jr. and sister-in-law Millie Loch of Maryville, Missouri. She was preceded in death by her father Clement O’Rourke; her sister Julie (O’Rourke) Fernandez; and her father-in-law Robert E. Loch Sr. and mother-in-law Betty Lou Loch. Memorial Mass 10am Wednesday, January 23rd at St. Gregory Barbarigo Catholic Church, Maryville under the care of Price Funeral Home, Maryville, Missouri. Rosary 6:00pm Tuesday at St. Gregory's Barbarigo Catholic Church. The family will receive friends following the rosary from 6:30pm to 8:30pm. In lieu of flowers, Jessica requested that donations be made in her name to the St. Francis Hospital Foundation earmarked for the Cancer Care Initiatives. They can be received at St. Francis Hospital Foundation, 2016 South Main Street, Maryville, Missouri, 64468. 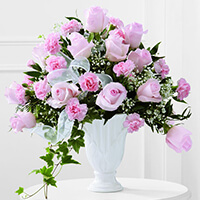 To send flowers in memory of Jessica Jayne Loch (O'Rourke), please visit our Heartfelt Sympathies Store. Christine Lanza and Amanda Cernik, Erin's Team Impact, and others have sent flowers to the family of Jessica Jayne Loch (O'Rourke). Bill and family, So very sorry to learn of the passing of Jessica. Times like these are never easy but be assured a new beginning will come for us all...Your Jessica will be waiting for you. Our thoughts and prayers are with her and you, her loving family. Wish we were able to be with you. We’re sending you and your family prayers and hugs. Christine Lanza and Amanda Cernik purchased the The FTD Deepest Sympathy Arrangement for the family of Jessica Loch. Our hearts are with Erin and family! May Jessica's loving light forever live in your hearts! We love you Coach Fingo! Erin's Team Impact purchased the The FTD Loving Light Dishgarden for the family of Jessica Loch.